A Special Care Unit is available at The Royal Dental Hospital of Melbourne for people with intellectual or physical disabilities. For further information, please telephone 03 9341 1000 (standard charges apply). 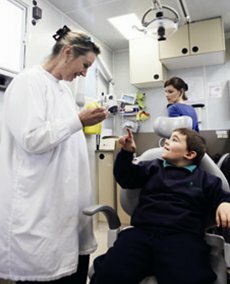 Dental Health Services Victoria has two special needs vans that deliver general dental care to children with a variety of physical and intellectual disabilities. Children who attend special or special developmental schools in metropolitan Melbourne or rural Victoria are offered free oral health care every one to two years. To find out more about services for children with intellectual or physical disabilities, please telephone 03 9341 1000 (standard charges apply). Do you need dental care provided at home? Our domiciliary service is available for people who are completely homebound due to their medical, physical or mental condition. To find out more, visit services for homebound patients. A range of oral health services are provided through high needs dental programs which target disadvantaged groups in the community. To find out more about the below services, telephone 03 9341 1000 (standard charges apply).